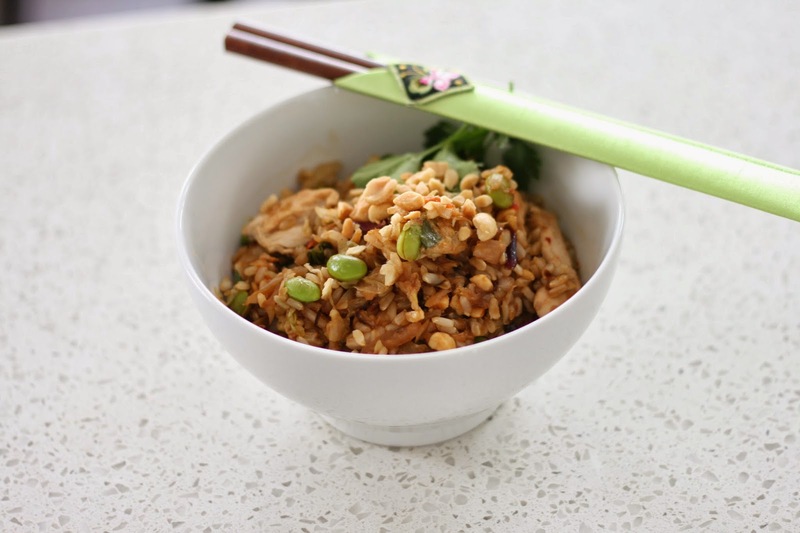 I always love a good bowl recipe, anything asian inspired and anything colorful. 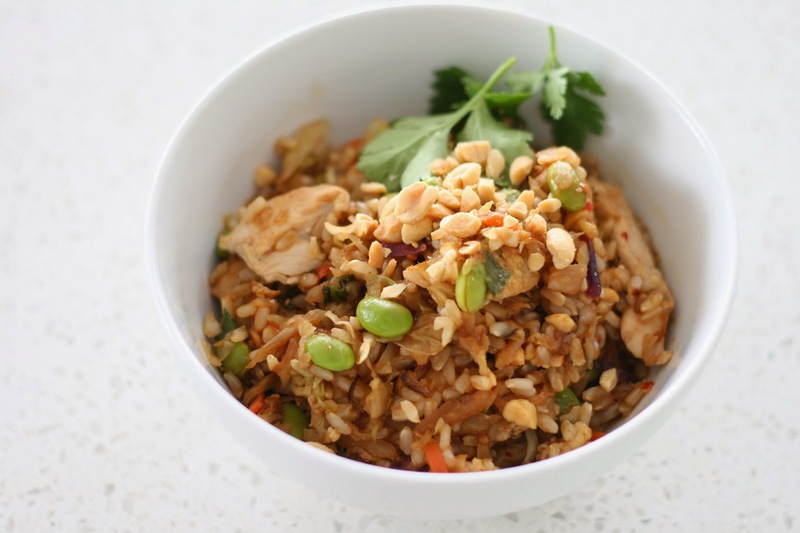 Peanut sauce is quite rich so use it sparingly and don't forget to cook the rice ahead of time (this always gets me with the bowl recipes). Combine all sauce ingredients in a microwave-safe bowl then microwave for 20 seconds. STir until smooth then set aside. Whisk together egg and sesame oil in a small bowl and then set aside. Heat 1 teaspoon of peanut oil in a large skillet over high heat. Season chicken with salt and pepper then add to skillet and stir fry until no longer pink. Remove to a plate then set aside. 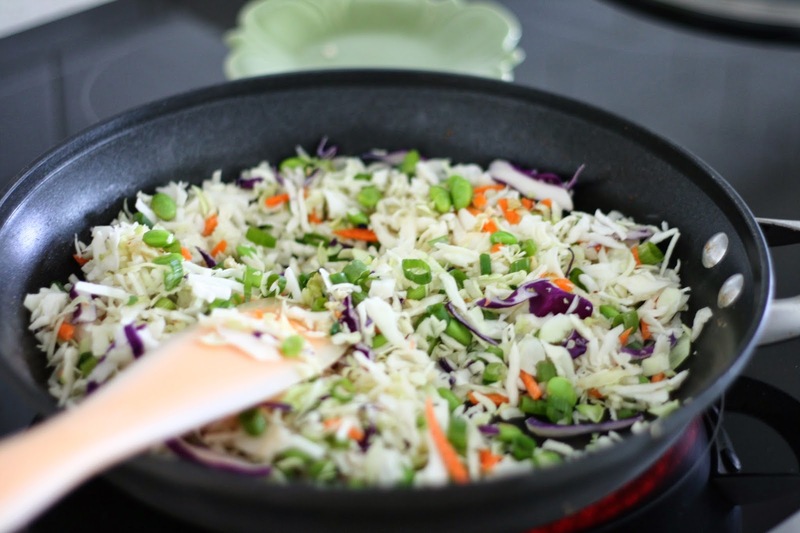 Heat remaining teaspoon peanut oil in skillet then add coleslaw mix, frozen edamame, and green onions. Stir fry until tender, 2-3 minutes, then push to outsides of skillet, creating a clear space in the centre. Add egg whisked with sesame oil to center of skillet then stir fry until soft scrambled. Add cooked chicken, rice, sauce, and half the chopped peanuts to skillet then toss to combine. Serve with remaining chopped peanuts. A good variation is to use green peas instead of edamame, this cuts out the effort to steam and shell the edmame. Also lately I've ended using the entire bag of coleslaw which is a lot more than 2 cups and its a good amount. The Male Edge is capable of increasing both the length and girth of your manhood and also cure penile curvature. To buy Male Edge at the most discounted price visit ExtenderOfficial.com and get Male Edge Coupon.